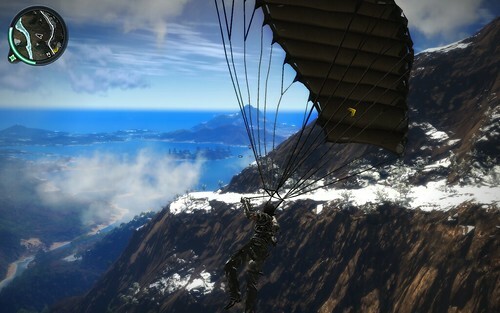 Just Cause 2 – Absolutely freaking awesome! 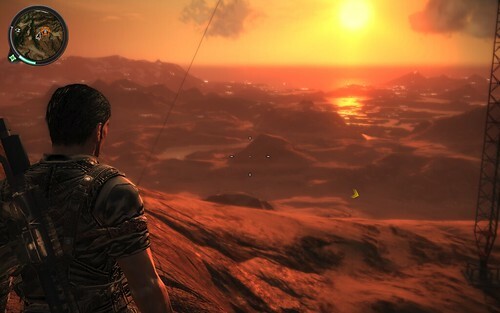 I downloaded the Just Cause 2 demo for my 360 a few weeks ago. It was extremely good fun. The grappling hook / parachute combo, and incredible visuals (the landscapes, oh my!) and sandbox nature really had me sold. So I pre-ordered it for the PC and have been playing it for the past few days. All I can say is that it’s truly jaw-dropping stuff. Once the training missions are over it’s a freeform sandbox of the highest order. The vehicles are brilliant – from screaming jet fighters, to helicopters to speedboats, and all manner of things in between. The landscape is a thing of beauty. A whole country to explore with complex river systems, dense jungle, snow-capped mountains, sun drenched beaches and urban cities. If you can see it, you can climb it (one way or another). Visually it’s as impressive underwater as above! With thick coral reefs and a variety of fish. And wow – the day/night cycle! Casting magnificent sunsets / sunrises, and the weather conditions – from dark black clouds with downpouring rain, to heavy snow. Yes there is a lot of gunplay. And the enemy AI won’t exactly have the Turing Test quaking in its boots. But if you are like me you’ll have fun just exploring the beauty of the place. The engine powering it is nothing short of stunning, and while the voice acting is dull, and the missions all kind of repetitive it doesn’t seem to matter – because that sense of wonder and amazement is JUST high enough to keep you engaged. The devs responsible for the Avalanche engine ought to be rightly proud of what they have achieved, because it’s nothing short of stunning. Best game I’ve played in a very long time. Check out my Flickr slideshow of in-game screen shots I’ve taken over the past couple of days. I’ve got nothing much more to say other than – it’s out! The Gravity Crash soundtrack by CoLD SToRAGE is available to buy online for immediate download. It costs £10 (which is probably £3 more than it ought to) but you get 16 tracks for your money, including some awesome remixes – most notable of which is a C64 SID rendition of the title track Scarface.